When you live in Japan, you travel like a Japanese person. And Japanese people travel in a very special way. First, most of them don't have or use vacation days, so they only travel on public holidays when offices are closed. This means that they anticipate crowds and congestion and prepare for it. It also means that their trips are really short and jam-packed with things. Japan has several precious three-day weekend a year, and most people with the travel bug take advantage of that break to visit a nearby (or not so nearby country) for exactly three days. I will never forget the first time I flew to Japan from Dallas, Texas. I met two Japanese woman in the airport who were having a layover form Orlando, Florida. Where they visited Disneyworld. I asked them about their trip and was shocked to find out it was only three days. By that I mean they left Tokyo and flew to Orlando on Day 1, spent an entire afternoon and evening in Disneyworld on Day 2, and were flying back to Tokyo on Day 3. I met them on Day 3. They literally undertook a 20-hour flight in a three day weekend. A decade later, a foreigner living in Japan, I had vacation days and I goddam used them. I didn’t have to follow the same rules, so I could avoid the crowds during those three-day-weekends, but I knew this was not reflective of the experience of my Japanese people. The Japanese people have learned to adapt to their strict work and break schedule and make the most out of their three day weekends, and the travel industry caters to this kind of traveler. 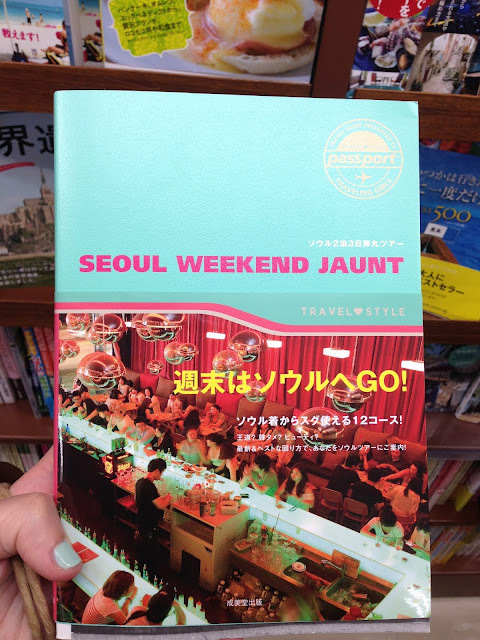 When my friend said “let’s go to Seoul for the three-day-weekend” I thought it was a good chance to see how Japanese people really travel. So I took the all-day journey from my village in rural Japan to Seoul, and I prepared for a tiring, jam-packed schedule or sights and shopping. Before my trip, I had the great fortune of find this book, Seoul Jaunt. This book was pretty much made for people like my friend and I, and is structured to accommodate the Japanese three-day-weekend. This book was my gateway to Japanese travel guidebooks, which are a millions times better than American ones. 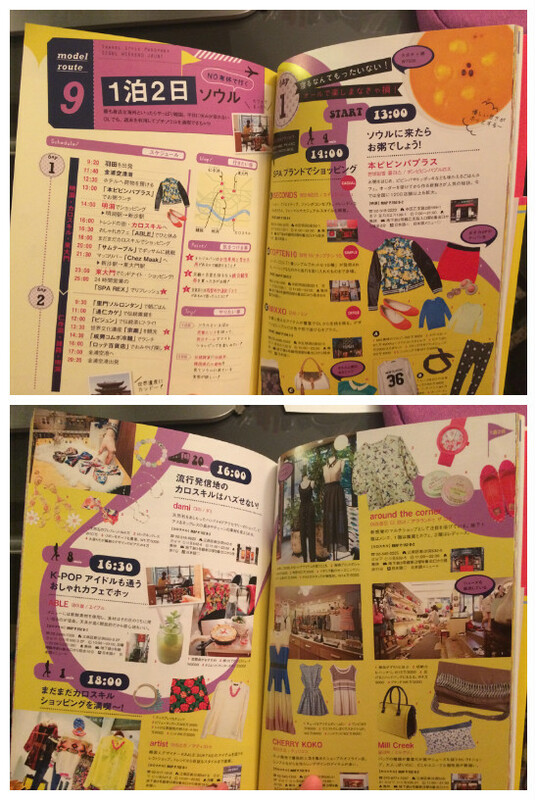 Japanese travel guidebooks have way more photos, show a variety of food and meal options, and are catered to specific interests. 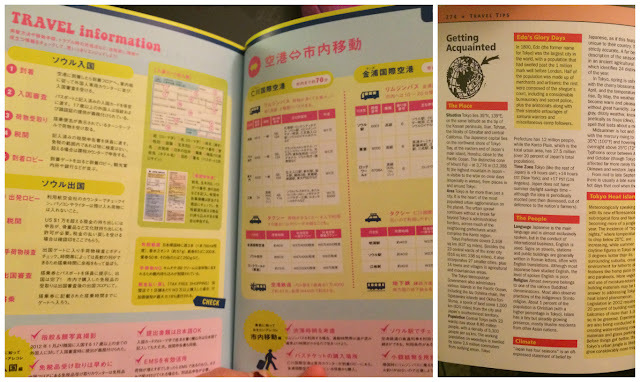 American travel guides are text heavy, have few photos, and usually they are black and white. They spend a lot of time on history and architecture and maps, whereas Japanese guides are more about your experience in a place. American guidebooks focus on tourist sights, and provide all the history and detail of museums, temples, etc. But Japanese guidebooks understand that everything you do in a place is part of your experience, so they over things, like a comprehensive list street food. 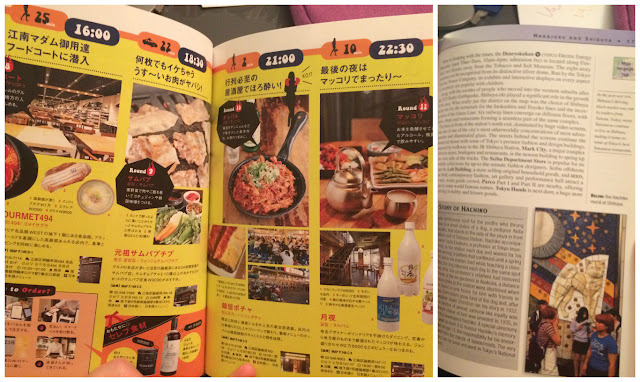 American guidebooks may only talk about the traditional cuisine in a place, but Japanese guidebooks will cover anything unique and interesting, even if it is not traditional or typical. The hotel list in the Japanese book has compelling images of the rooms in each of the hotels they feature. In an American Guidebook, there is only a list with minimal information. How am I supposed to select something from that list without further research? 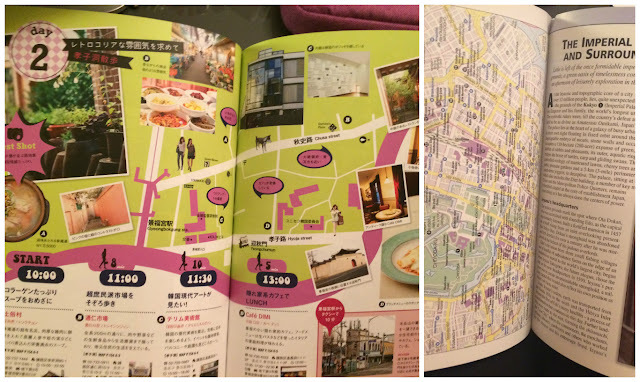 In the Japanese guidebook, a map with a simple itinerty is featured The map shows street names, intersections, and locations of key destinations. In the American version, there is a ton of text on the background and history of a few places in a particular region, then a massively over-detailed map which no one could realistically use to find anything. In the Japanese guidebook, different restaurant options are show with delicious images of food. 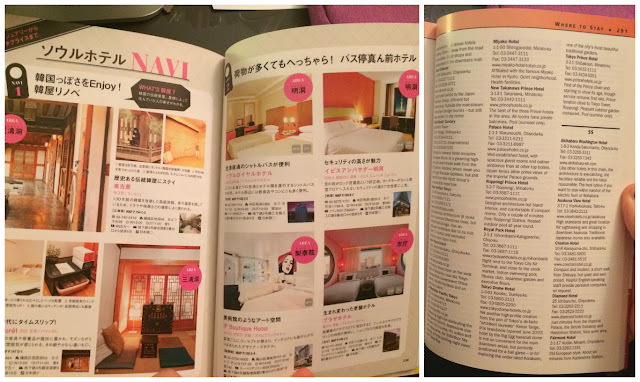 On the right, observe how text-heavy the American guide is (who has time to read all that?) - and with only one uncoupling image. In fact, most of the images in the American guidebook were everyday shots of people on the streets, city parks, and buildings, but nothing about food, shopping, or the things I am likely to personally encounter on my trip. 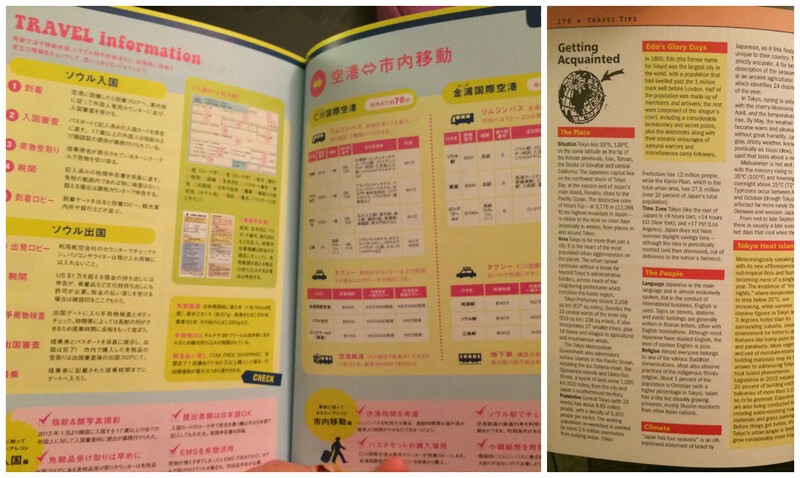 Even the boring "how to buy bus tickets" and "how to fill out the immigration form" are on colorful well-designed pages, compared to the boring graphic-deficient American book. Lastly, here is a page you won't often find in American books. 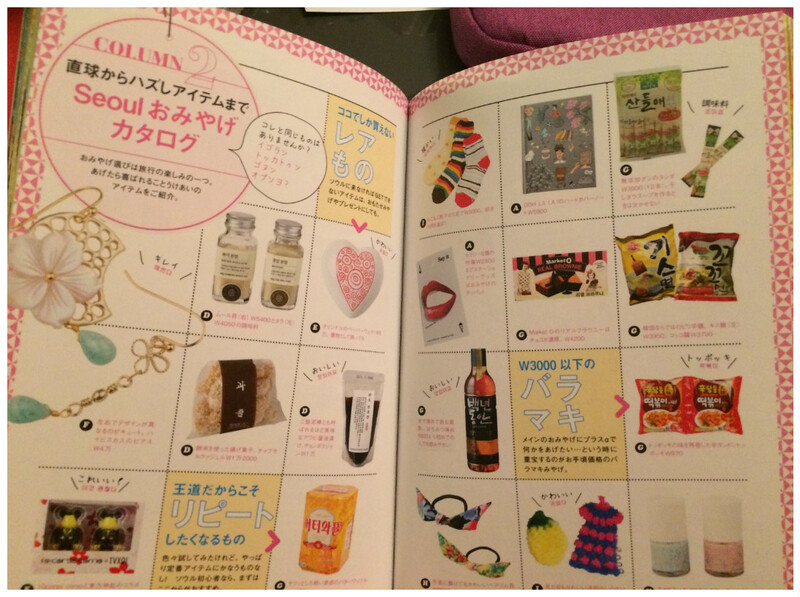 This is a "gift catalog" which shows ideas for things to buy as gifts for family, friends, and colleagues when you return from your trip. Japan has a big gift-giving culture, and if you travel anywhere, you are expected to bring presents for practically everyone once you return.